The challenge from Sprinkles is to find something from Jan Tink that you LOVE, and CASE it (Copy And Share Everything)! So, after a few days of perusing her blog, I came across this.... How Stinking cute is that? OK, well since Sweet Sentiment is going to be a gift basket business that I'm starting (if anyone needs a gift basket, please get a hold of me!!!) I thought that I'd throw together a quick little something..... Now mind you; this is something that took me like 5 minutes to make, because I have a 3 year old pulling on me saying, "mommy get up." So anyways... here's my "Break up" basket! 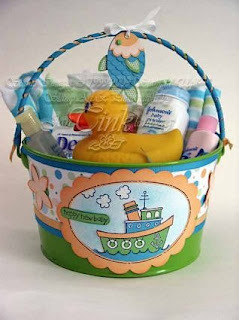 I love this little pail that I found at the craft store the other day, and what a great way to use it!!!! 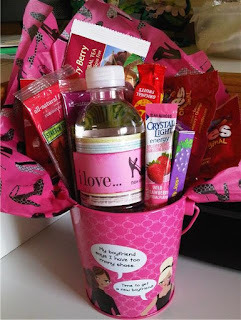 I threw in some sweets and a drink mix and thought "this is for the girl who is breaking up with her boyfriend because he thinks she has too may shoes, she must have a pair of gym shoes in there, so here's a bunch of sweets that make her feel like she's indulging, but it's all low calorie/fat!!! She's gunna have shoes, and a rockin' hot bod!!!" Yeah, I know, long though... but hey, that's how my mind works! ahahahahah OK.... so as soon as my hubbs gets back from the gym, I'm off to the track to put in my 3 miles.... hopefully. I've got my bottle of water and my pocket full of cough drops... wish me luck! I LOVE this idea . Its so hard to see from the tiny blackberry screen just how cute this is.